For all freshwater and saltwater fish only tanks up to 100 gallons. A self priming 340 gph pump that eliminates manual siphoning. Dimensions: 6.5" D, 9.5" W, 15.5" H.
All hoses, plumbing parts, filter media, etc, included. The Aqua Stop: A quick and convenient filter hosing connection/disconnection mechanism. Twin mechanical foam filter screens. Multiple filter media baskets with partitions--can be used for a variety of media. Comes with foam inserts, carbon and biological media. 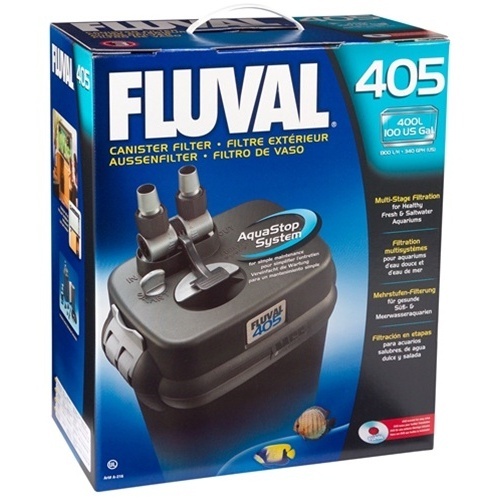 To purchase other media visit the Hagen Fluval Canister Filter Media page.